Emmy-Award winning trumpeter, composer and educator Orbert Davis is co-founder, conductor and artistic director of Chicago Jazz Philharmonic (CJP), a 55+ piece symphonic jazz orchestra dedicated to bringing together audiences of diverse backgrounds through multi-genre projects. In 1998 Davis founded “Jazz Alive” (the Arts Education outreach arm of Chicago Jazz Philharmonic,) an interdisciplinary enrichment program that focuses on teaching life and academic skills through music and the arts. Currently running in fourteen Chicago Public Schools, the program also to creates and develops “jazz bands” at the elementary school level. Davis also owns and operates Discover Music: Discover Life, Inc. a company that develops curriculum and implements programs that uses music to teach academic and life skills. Orbert was consultant to Academy Award winning director Sam Mendes, for the feature film “Road to Perdition” starring Tom Hanks and Paul Newman. Recent projects include “Home and Away”, a Boeing Company commissioned that honors U.S. service men and women, and an Emmy-Award winning original score for the national PBS documentary “DuSable to Obama: Chicago’s Black Metropolis” produced by WTTW. Orbert’s 2004 CD release entitled “Blue Notes” was the follow-up to his critically acclaimed “Priority” CD, which garnered an LA Times 4-star review, hit Top-50 “most played on national radio” Jazz CDs in 2002 and was named Top-10 best Jazz CDs of 2002 by the Chicago Tribune. Orbert’s latest release, Chicago Jazz Philharmonic’s “Sketches of Spain [Revisited],” is an orchestral transformation of the 1960 iconic original by Miles Davis and Gil Evans and is currently receiving rave reviews internationally. Orbert recently celebrated his 150th show as radio personality and host of “The Real Deal with Orbert Davis”, a weekly 3-hour program airing on 90.9fm WDCB (also streaming live online at wdcb.org). 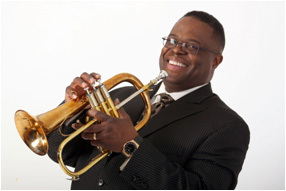 Orbert has a Bachelor’s degree in trumpet performance from DePaul University and a Master’s degree in Jazz Pedagogy from Northwestern University. He is a former associate professor at the University of Illinois at Chicago and artist-in-residence at Columbia College Chicago. He lives in Chicago with his wife Lisa, their two daughters, Zoe and Sydney, and sons, Orbert and Benjamin.